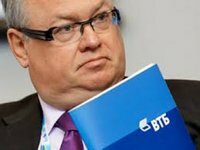 VTB will probably not succeed in selling its business in Ukraine, the Russian bank's head, Andrei Kostin, told reporters on the sidelines of the Eastern Economic Forum. The VTB Group currently has two banks operating in Ukraine: VTB (Ukraine) and BM Bank, which VTB received after acquiring Bank of Moscow. The group announced plans in May 2016 to sell VTB (Ukraine) if it received an interesting offer, but in June the VTB management said that it had suspended its active search for buyers. Talks about the group's leaving the Ukrainian market resumed in March 2017, after Kyiv had imposed sanctions against Ukrainian banks with Russian state ownership. The restrictions imposed for a year prohibit them from conducting any financial operations for the benefit of their parent companies. VTB has said on several occasions that the Ukrainian authorities don't want the sale of the banks. The National Bank of Ukraine has not yet approved any bids from potential buyers. "We'll be downsizing our business there and our expenses, selling assets little by little, withdrawing what loans we can and maybe selling all kinds of collateral. But probably nobody will let us sell anything there," Kostin said on September 6.